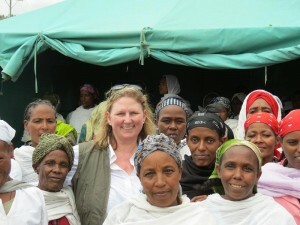 Visiting with women from a Chancho-based Self-Help Group in April, 2012. As the Ethiopian visit wraps up, Heather Johnston, CFTC’s Director of Programs, joins Amboka Wameyo, Regional Program Manager – Africa, to co-facilitate Roadmap to Change workshops with our Ethiopian partners and other key stakeholders. But before the workshops, Amboka met with two of our Ethiopian partners , ISAPSO and CHAD-ET, who are doing really strong work outside of the capital, Addis Ababa. ISAPSO supports good livelihoods through Self-Help Groups (SHGs) and Village Savings and Loans Associations (VSLAs) in Chancho and Sululta Townships, northeast of Addis. 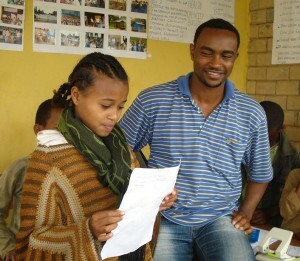 CHAD-ET has a focus on early childhood and primary education, and works in Woliso District, southwest from Addis. Ethiopia has made tremendous strides towards poverty reduction overall, and is right now on track to achieve at least six of eight Millennium Development Goals, including poverty reduction and education. But, it’s still home to deep pockets of food-insecure women, children and men. Many families, lots of them female-headed households, struggle to earn an income adequate to meet their basic needs within an economy that is experiencing double-digit inflation. The choices that some need to make are very difficult – but ISAPSO and CHAD-ET are definitely on the leading-edge of development practice trying to make it easier for them. ISAPSO’s support for SHGs and VSLAs marshall the power of the community itself to build skills, ignite individual and collective self-confidence and capacity, and bring economic empowerment to all. CHAD-ET ensures that the Ethiopian government’s education strategy is able to be implemented by bolstering the infrastructure and community support needed to turn policy into action at the grassroots, local level. CHAD-ET’s relationships with municipal and regional government agencies and representatives is of tremendous value, and will help ensure CFTC’s plays a strong, sustainable and supportive role in community development through our Roadmap to Change. September 6, 2012, Addis Ababa –A number of key things have happened since my last blog. For one, Heather Johnston, CFTC’s Director of Programs, arrived to support the Theory of Change workshop organized for CFTC staff and partners on September 3 and 4, 2012. The workshop was successfully completed with the team beginning the exciting journey of developing CFTC’s three-year plan for Ethiopia. Heather will be blogging about that separately in the next couple of days! 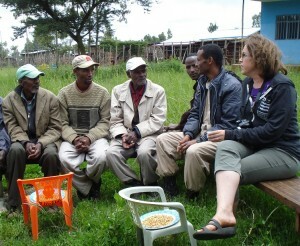 Director of Programs Heather Johnson listens to an Early Childhood Centre management committee in Woliso. Secondly, I have been able to travel with Heather to visit two CFTC partners: Integrated Service for AIDS Prevention and Support Organisation (ISAPSO) and Organization for Child Development and Transformation (CHAD-ET). A key realization for me this week was that despite double-digit economic growth, youth unemployment is very high in Ethiopia. According to the Africa Development Bank, growth in Ethiopia has not provided adequate employment opportunities for the young. During the field visits to urban and rural low-income communities with CFTC partners ISAPSO and CHAD-ET, I realized that the impact of this high unemployment is to push those who are disadvantaged further into distress. Young people who are not able to find employment are forced to accept high-risk work in which they are often exploited and abused. Even with very visible economic growth, the community members that CFTC and its partners target are faced with the challenge of surviving in an economy where high inflation means rapidly increasing prices. 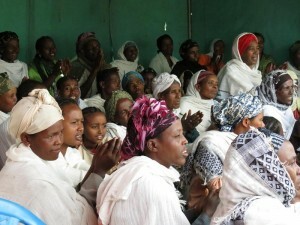 Women participating enthusiastically in an ISAPSO-supported self-help group, Chancho, Ethiopia. With CFTC support, ISAPSO is helping local community members in Chancho and Sululta districts to gain business skills and become adept at generating income through small businesses. ISAPSO is investing in business infrastructure, e.g., helping to build market stalls on busy routes to attract business from vehicles travelling through the districts into Addis Ababa. With CFTC funding, ISAPSO has been supporting Self-Help Groups (SHGs) made up of women of all ages. Chancho now has 17 active SHGs supported through CFTC resources. In the neighbouring Sululta district, there are 12 active SHGs, which Debra wrote about in April. ISAPSO’s second stream of programming is to focus on young people in school beginning from early childhood (kindergarten) through completion of primary school. Using a variety of techniques, ISAPSO keeps young people motivated and hopes to prevent them from dropping out and sliding into risky occupations. ISAPSO’s early childhood education strategy is long-term. Although it does not produce immediate results, Ethiopians understand that educated youth will be better able to find suitable employment in the coming years. A CHAD-ET beneficiary reads a poem in a Woliso District education centre. We then moved on to visit another partner: CHAD-ET. Similar to ISAPSO, CHAD-ET focuses on keeping young people in school and helping them attain an adequate standard of education. CHAD-ET’s programming is focused in Woliso District where they have formed from strong linkages with the Woliso Municipality, particularly with the education officer. CHAD-ET supports infrastructure renovation in schools and the implementation of government curriculum in schools. To achieve broader impact within the district, CHAD-ET sits on the local NGO forum and through that, is able to influence implementation of education policy. Again, the impact of this investment in youth education is long term. As we left Woliso, it was encouraging to see young people (and at least one elderly man) use the various recreational facilities provided free of charge at CHAD-ET’s Woliso offices. At the ‘reading corner’, an elderly man borrowed a book (he lobbied very hard trying to get two books but the librarian was very strict!). 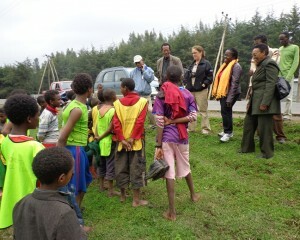 Youth football team in Chancho Town in discussion with CFTC and ISAPSO staff. At the playground, children kept themselves busy with football. In the evening, just before we left Woliso, a group of very active older youth were busy playing volleyball. The work that we are supporting through our partners CHAD-ET and ISAPSO may not immediately address unemployment. However, it does prepare children to be better equipped as they enter the job market and at the same time provides alternate recreational services to youth who would otherwise find it hard to keep themselves gainfully occupied. I am leaving Ethiopia this weekend, grateful that I have seen the work supported by CFTC, humbled by the commitment of our partners, and confidently optimistic that the support we are providing in Ethiopia will lead to lasting change. It’s been great blogging for you for the past several weeks, and I look forward to connecting with you again sometime soon!